Even though the the Algarve is only some 90 miles long and 30 miles at the widest point, there are still more than 100 miles of beaches. About 150 of them have names, thirty of which are European Union 'Blue Flag' beaches which I guess makes them the 'real' beaches. They are among the best and cleanest in Europe with most of the main beaches (indicated) having Lifeguards on safety patrol at least during the peak season. I've listed just some below, which I'll add to, as I discover, visit (the ones with more detail and possibly my photographs) or just brief notes if I am told about them or have found them elsewhere on the web. This section will never be complete as I reckon it will take several years to visit all of the possibilities! Some of the better beaches are not directly or easily accessible from the coastal towns (in fact at the south western tip around Sagres, they can be some distance along along precarious dirt roads), These are the ones that can be more 'natural' and picturesque and are worth the effort to 'track down'. There is plenty of choice when it comes to Algarve beaches, in fact just about guaranteed to please everyone. On the west coast (from Odeceixe to Ponta da Sagres) there are more varied beaches. Being open to the Atlantic Ocean they normally present significantly different conditions to those found along the southern coastline. This stretch is quite rugged with impressive cliffs formations separating the beaches. The winds, which can be intense and (believe it or not) very cold at times, give rise to large sand dunes on the longer stretches of beach. The sea is usually quite choppy with big waves ( perfect for surfers ) but are often combined with a dangerous fast undercurrent. Be warned. However if you are there for the scenery it can't be beaten. The southern coast (from Ponta da Sagres all the way to Vila Real de Santa Antonio) has more smaller secluded beaches (usually in coves) and are more subject to seasonal weather conditions at the south-western end. They gradually become more open and extensive as you move south-east. As it is only a couple of hours drive ( by the smart motorway ) from one end of the coast to the other you can experience changing scenery, and even sea conditions within a relatively short driving distance. Some of the main / larger beaches use the safety flag system - Red Flag - Bathing forbidden, Yellow Flag - Bathing with caution, Green Flag - Safe to swim. A chequered flag (usually blue and white) indicates the lifeguard is temporarily away from the beach. The flag system does not operate on all beaches and usually only between June 1st and September 30th. Take care when there is a strong wind and there are usually strong undercurrents where there are big waves (this is especially so on the West Coast beaches). Many of the beaches, in or near to the holiday resorts, offer most water sports facilities as well as bars, restaurant food and snacks. Just follow any signs that indicate “Praia” (which means “beach” in Portuguese) and I'm pretty sure you won't be disappointed with what you find. Important Note: Those wonderful cooling sea breezes that come off of the Med and certainly 'around the corner' the Atlantic hide the fact that you are being incinerated by 90+° temperatures. Be careful! Odeciexe A long beach, cut in two by the mouth of the Seixe creek. The resort is peaceful and family oriented with facilities for visitors. There are impressive views of the sea from the Miradouro da Ponta Branca. Snack bar, Restaurant. Sunbeds. Blue Flag beach. Lifeguard. Road Access. Close by is the old Moorish town of Odeciexe complete with a fort on the hill. Quebrada A very narrow, little visited beach. Samouquiera Quiet, little frequented beach. Vale dos Homens Quiet, little frequented beach. Carriagem Quiet, little frequented beach. Amoriera These two beaches lie next to each other, separated by rocks. There are facilities for visitors. 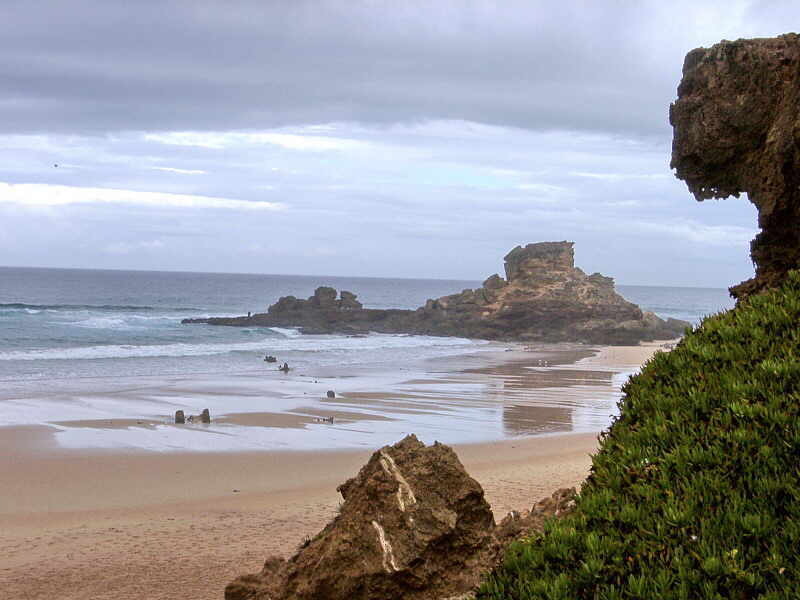 The coast is punctuated by fascinating rock formations, ending at Ponta da Atalaia, which means Lookout Point. Praia da Arrafina This is a beach which also is considered to be reasonably safe for swimming and a very special place with quite stupendous views. Take the road north to Lisbon from Lagos. Just before reaching the small town of Aljezur take the turning left when you see the name “Arrifana”. On reaching Arrifana you will find the beach on your left at the bottom of a very steep narrow road with little or no parking area at the bottom. A long stretch of sand sheltered by cliffs with a picturesque fishing port. Arrifana is linked to the historical figure of the Moorish prince and poet Ibn Caci (12th century) who lived here as a recluse. There are ruins of an old fort (17th century) built to defend the tuna fishermen and their gear. At the end of the cliffs Pedra da Agulha (literally Needle Rock) rises impressively from the sea.. A visit to this beach out of season is seriously recommended. Canal Beach of great beauty that sees few visitors. Penedo Beach of great beauty that sees few visitors. Vale Figueiias Has few visitors despite the picturesque beach and good surf. Surfcamp location. 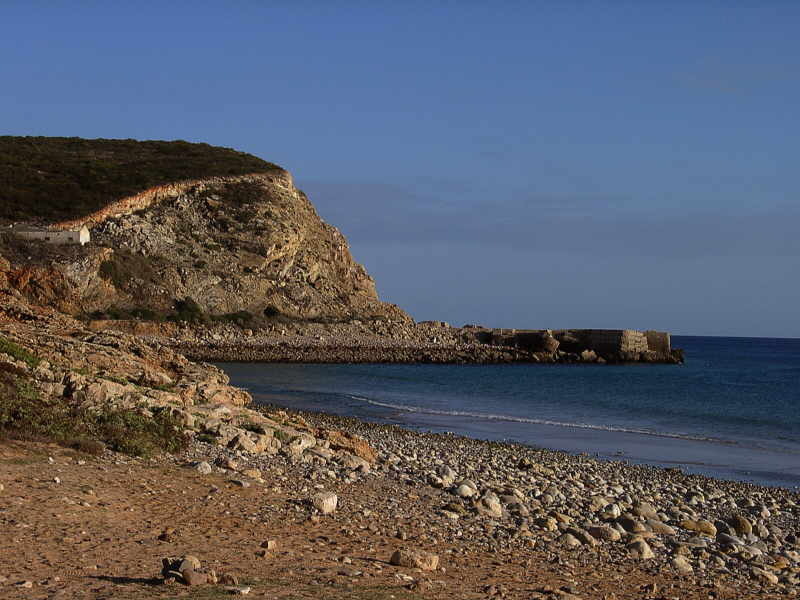 A exceptionally long west coast beach, just north of Carrapateira and its spectacular cliffs (can be reached by car). It can be reached by travelling north from Vila do Bispo, then after passing the small village of Carrapateira, turn where at the sign that reads “Praia”. (beach), there is plenty of parking. A long sandy beach with many sand dunes. Its a great place to learn to surf as it is rock free and there is plenty of room to manoeuvre. It is virtually deserted out of the season except for the keen surfers. A good place to walk. There are a couple of snack bars / bars just off the beach. Life Guard. There are the ruins of a former defensive fort built to repel pirate attacks (17th century). Between the this beach and Amado lies the rock formation of Pontal, surrounded bays and high cliffs. Amado Near to Amado the so-called Pedra do Cavaleiro (Knight's Rock) stands just off shore. Murração A small beach with a broad stretch of sand. Mirouço An isolated beach. Access is difficult. One of the few beaches on the west coast were it is safer to swim due to the lack of underlying dangerous currents. This beach is located just to the north-west of the small town of Vila do Bispo and be warned the drive is not for the faint hearted. It is a long narrow road which takes you up into the hills and down again. It is one of the smaller beaches and has a completely different atmosphere to those found on the southern coastline. It may not suit everyone but those that do visit tend to return. A beach surrounded by rock formations. A single sizable Beach bar with fresh fish ( as and when they are caught ) and a welcome beer. Águia Stretches of sand at the foot of steep escarpments. Little visited due to poor accessibility. Tonel A sheltered beach with good views of the Ponta de Sagres and Cabo de São Vicente. Support facilities until September only. Strong currents, caution advised. Update: In light of the recent tragedy on this beach (2007) I cannot emphasise the caution needed when using the beaches especially on the West Coast. They are not necessarily manned by lifeguards and can be extremely isolated in the off season. Beliche Restaurant, Cafe, Road Access, Parking. Belixe Sandy beach at the font of a small bay scooped out of the cliff. Calm. A road / track just off of the roundabout in Sagres takes you down a the cliffs to this beach. There is parking space all the way down the track. A nice Restaurant and terrace Cafe / Bar on the beach. Sunbeds and umbrellas for hire. Baleeira Long beaches. Tourist facilities. Starting point for discovering the underwater delights of a coast dotted with caves and hollows. PRAIA DO MARTINHAL This beach is located in the Bay of Baleeira close to Sagres. Another windsurfers paradise and is a smaller beach in a reasonably shallow bay that is shouldered to the west by Ponta da Atalaia. 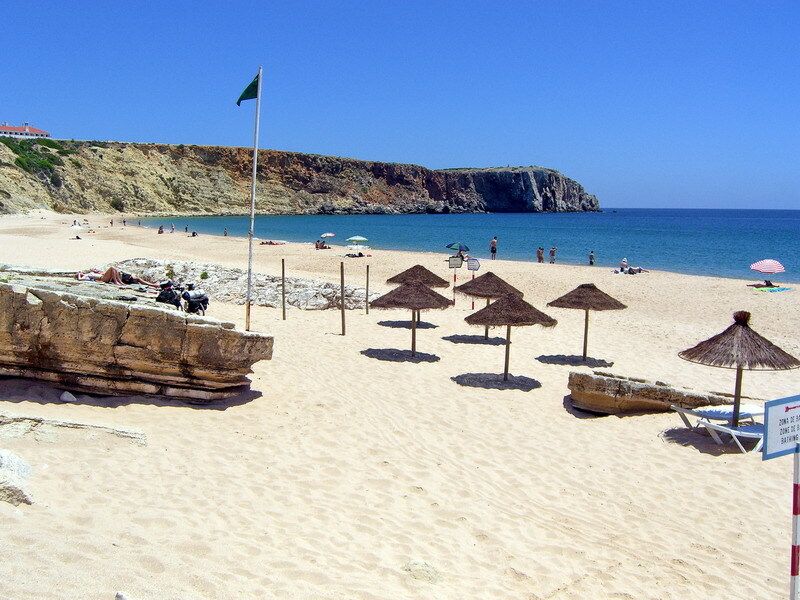 It is recommended as a location if visiting the area of Sagres. Blue Flag. Lifeguard, Restaurant, Cafe. Road Access. Parking. Barranco Sandy coves on the edge of little bays. Calm. Tourist facilities. Boca do Rio Stretch of sand along the bottom of a valley crossed by two quiet streams. Peaceful. Remote but accessible by road / track from Burgau. It has a very good beach bar / restaurant, but that's all! An old stone quayside where quarried stone used to be shipped out and the workers cottages on the hill are a feature. Definitely a hidden gem. Not sure for how much longer as there is now a minibus service to / from several nearby hotels and also some extensive building going on at the head of the valley (09/06). Burgau A typical fishing port looking out on the sea. Peaceful and very family oriented, but starting to get really busy these days in the high season. Tourist facilities. The beach virtually disappears at high tide and is surrounded by cliffs. It is reached by a steep cobbled street and although there are parking facilities at the foot of the slope it is advisable to leave your car at the top and walk down. This beautiful sandy beach is overlooked by the bars and restaurants of the village itself. 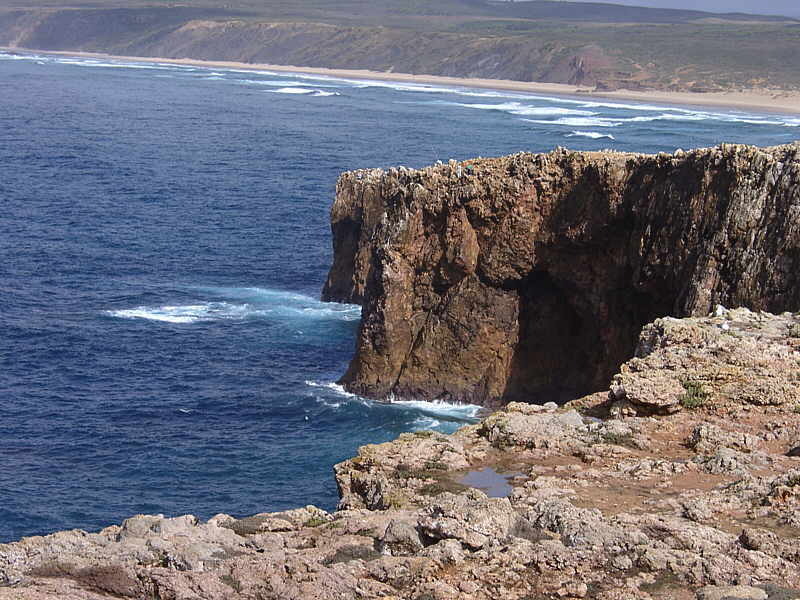 Not to mention the spectacular 'Rocha Negra' (Black Rock) see the photograph. It has a good water sports facilities - snorkelling, windsurfing and sailing school, paddleboats and some boat trips. It is a safe beach, ideal for children. Ponta da Piedade If it's interesting landscapes you're after then this is a must, located near Lagos. The rocks have been sculpted into weird shapes by the sea's action. There are lots of small cove beaches to choose from. Praia do Vau You will find this good-sized beach at the far western end of Praia da Rocha’s seafront road. There is easy access from a car parking area. Cliffs giving afternoon shade at the far end. Prainha This small beach takes its name from the cliff top holiday complex, which provides a lift up and down between July 15 and Sept 15. Mind you there is a charge for non-residents. Otherwise, for the fit there are steps. MEIA PRAIA Being the biggest of the Lagos beaches, it forms half of the walk from Alvor to Lagos (the other half is the entry below). It takes its name from being part of this walk as “Meia” indicates the word “half”. The approach to this beach is from the town of Lagos and it is easily accessed. This beach is popular with windsurfers and surfers alike as it faces the open Bay of Lagos and also protected to the west by the promontory of Ponta da Piedade. The beach is possibly a little longer than that of the Alvor and there are many small beach bars to satisfy the thirst or to briefly get out of the sun for those who wish to walk its length. 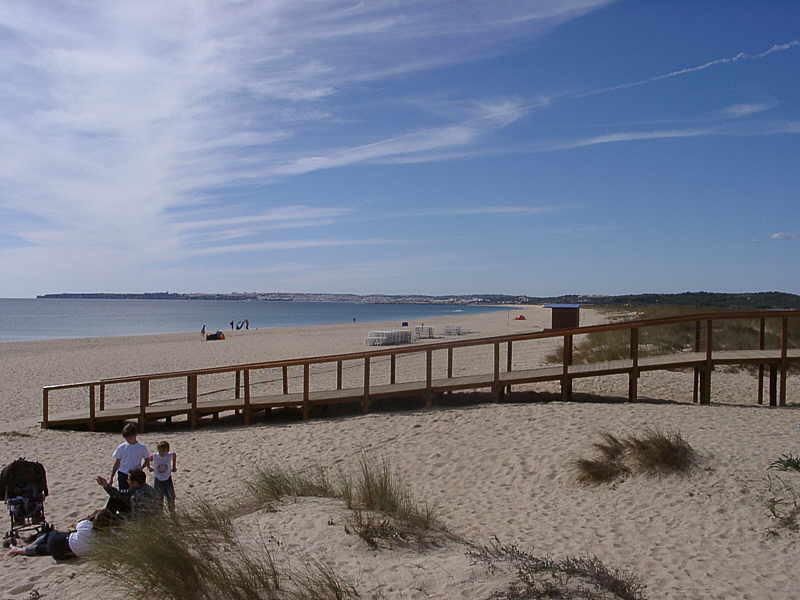 This is a massive, wide and open beach in front of the village / town of Alvor fringes the eastern half of Lagos Bay. You can walk straight on to it. It stretches just over two kilometres from the village to the west in the direction of Lagos. There are sand dunes but no cliffs. This beach acts as a sand bar creating an interior lagoon which acts as a form of port for Alvor. Some twenty years ago you could walk (at low tide ) by beach all the way to Lagos by wading across a small sea which was then a shallow outlet from the lagoon. Popular among windsurfers, and good for other waters ports as well. Plenty of parking available. There used to be a stack of smallish beach bars in various stages of decay along its length, but now ( 2005 ) they have all gone and have been replaced by three larger new bar / restaurants accessible by a proper road. Torralta This is really a continuation of Alvor beach in front of the Torralta holiday complex tower blocks, just to the east of Alvor village. João de Arens A small stretch of sand set among cliffs, rocks and islands. Vau A charming beach flanked by cliffs. Its calm, iodine-rich waters and fascinating rock formations make it popular with families. 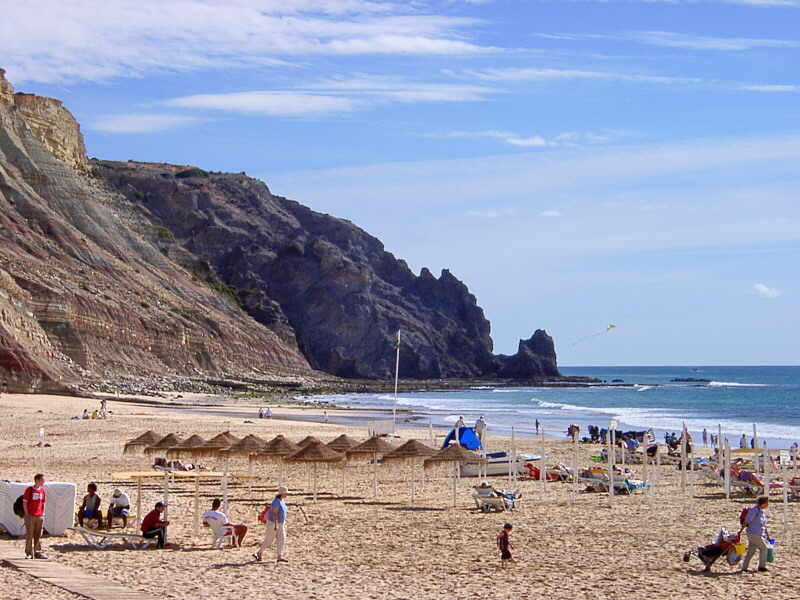 Carvoeiro This small sandy beach with both a bar/restaurant and toilets by the beach is ideal for children. It has good car parking facilities. Praia da Galé A popular spot for windsurfing and scuba diving, about 8 km (5 miles) west from the centre of Albufeira. A very long stretch of sand that you can drive to. There is plenty of parking close by as the only cliffs are either end of the beach. It looks out onto the Armação de Pera bay, where you can watch the water sports. There is a Beach bar. Praia do Castelo This is reached by a short sandy track down a steep hill whereas Praia da Gale (above) can be reached by road. A safe sandy beach with nearby car parking facilities and a beach bar. Although it close to the resort (Albufeira) it feels remote with lovely sand dunes and is relatively un-crowded. Great natural beauty. This is an ideal beach for exploring as it is divided into two sections. The first is by the car park which has a bar / restaurant and is lined with a colourful display of fishing boats. The eastern end has rocks and from here it is possible to find small secluded sandy coves. Quarteira A large and busy beach which runs from the east all the way to Faro. On the fringes of the resort there are some remote areas where you can leave your car. The beach is gently sloping and is ideal for children; in peak season there are lifeguards and the safety flag system. There are several beach bars and windsurf hire is available. Praia da Rocha This is probably the oldest and best know beach in the Algarve. It is located just south of the main town of Portimão and was originally much shorter in width and with a lot more charm. This beach in the past has been seriously enlarged with the sand that was pumped out during the dredging of the Portimão Harbour and at the same time meeting the needs of the many visiting tourists to this area. discovered by tourism at the end of the 19th century, it was for decades the favoured resort of rich families from Portimao, the Algarve and Andalusia in summer, and of the English in winter. The Hotel da Bela Vista, with its Belle Époque architecture and decoration, dates from this period. There are acres of wide open sand as far as eyes can see right in front of Praia da Rocha’s seafront road. It is very popular but so big that you are sure to have plenty of room to stretch out. A tunnel at the western end leads to narrower stretches of beach, made all the more attractive by a backdrop of cliffs and pillars of rock close to the shore. At various points on the seafront road there is access to the beach by steps. There are patches of afternoon shade by the tunnel and next to the cliffs further on. With car parking nearby and excellent facilities such as a range of bars/restaurants, deep-sea fishing, sailing, windsurfing and water-skiing it is an ideal family beach. PRAIA GRANDE This long wide beach can be found opposite Portimao harbour. The southern end is more scenic. It has a windsurfing school and paddle boats for hire but a word of warning - beware of strong tides. The three Islands of Armona, Culatra and Farol act as a barrier to the sea and on the inland side there are the extensive lagoons forming the nature reserve of Ria Formosa. Reaching these beaches can only be done by a ferries ( each with a destination to one of the three islands ) which leaves from the fishing port of Olhão. The journeys can takes about 30 minutes and leaves at approximately 15 minute intervals during the day ( seasonal ). As you can imagine once you arrive at the chosen Island you are going to find yourself as one of the limited number of humans visitors. The beach looks out onto Baia de Lagos and has a selection of bars. Praia Verde Located west of Monte Gordo and stretching towards Tavira, this beach has a pleasant backdrop of greenery (hence the name). It's a safe beach that is suitable for and popular with families that include young children. Armação de Pera Home of the 2006 sand sculptures exhibition, Near Pera. Praia da Falésia This beach is sheltered by low red-brown cliffs, which makes a bit of a sun trap. It's accessible by road from Vilamoura by travelling westward toward Olhos de Água. There is a Roman villa nearby at Cerro da Vila. Located west of Vilamoura before reaching Olhos de Água. This beach fronts the chic area of the holiday resorts known as Quinta do Lago and Vale do Lobo. This beach can now be easily reached by road and one area popular for its beach restaurants is a section know as “Julias” – a local lady and a character who opened the first beach place at the time when access was either by horse or by a very sandy road through the pine trees. This beach is a long narrow sandy bar that is accessed by a road crossing a lagoon just south of the Faro airport ( yes, it is noisy ). Being near to the principal town of the Algarve ( Faro ) it is usually very busy. There are plenty of water sports faculties and also plenty of restaurants / bars. Praia Ilha de Tavira A short boat trip from Tavira's jetty, this sandbar beach is a popular attraction, locally referred to as Praia das Cascas. Also has an area for naturists about one kilometre walk to the west end of the beach. Santa Luzia - A vast beach that offers hours of solitude, coupled with the pleasure of warm, clear waters. accessible from Pedras del Rey. Blue Flag beach. Lifeguard. Sunbeds & Umbrella rental. Restaurant. Snack bar. Road Access and Parking. Ilha da Tavira There are regular ferry crossings to this island, which lies opposite the city and has long beaches. Blue Flag beach. Lifeguard. Sunbeds & Umbrella rental. Restaurant. Snack bar. Road Access and Parking. Cabanas Separated by an arm of the Ria Formosa, Cabanas is quite and isolated. It can be reached by boat from Tavira. Conceição Opposite the village of the same name. Reached by boat. Extensive beach. Very calm.